The Curly Coated Retriever is a gundog that brings back shot birds from both land and water to their waiting hunter. Although many gundogs can retrieve, the category of retrievers are more specialized at the task of finding drowned waterfowl. The Curly Coated Retriever is the tallest of the retrievers and the oldest of those from England. 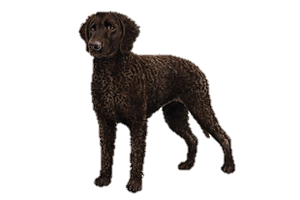 Evidence traces the Curly Coated Retriever back to at least the early 1800s, making it the oldest surviving English retriever. It is believed to have descended from crosses between the extinct English Water Spaniel and the lesser St. John’s Water Dog (ancestor to the Labrador Retriever). Some believe that the Irish Water Spaniel or setters may have also been in its early makeup. Later the Poodle would be added to help tighten the curl of their coat. Their popularity declined at the beginning of the 20th century, favor turning to the Flat Coated Retriever. Despite this the Curly Coated Retriever has maintained favor worldwide, although its numbers remain small. Is the Curly Coated Retriever Right for You?